The Charleston Plus Mail Post will create a striking, distinctive visual that will sure to get noticed. Mayne’s Mail Posts are crafted from 100% high-grade polyethylene for durability and longevity that will last throughout the seasons. The New England style Mail Post fits over a standard 4×4-inch post and creates a stunning, classic look. Included is a large decorative post, mailbox support arm, and built-in paper holder. Bring the past together with the present in a way that’s provocative and radiant with the Charleston Plus Mail Post. Good taste and superior quality never go out of style. 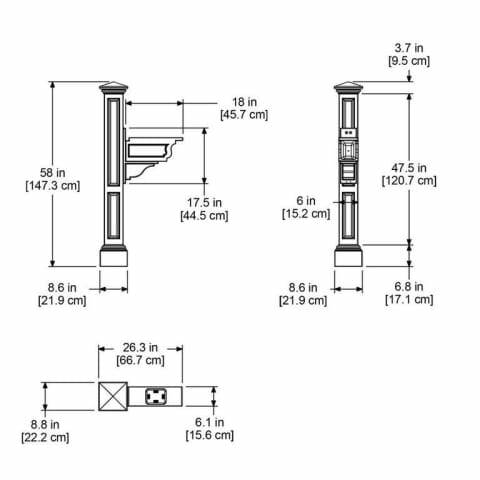 Medium mailbox recommended minimum 6 1/2 inch width. Best suited for mailboxes weighing less than 14lbs.